It was quite exciting to see all the inscribed grave slabs at Carrowntemple. Along with the many carved figures and heads at many Early Christian sites across Ireland, these cross slabs are among my favorites. The information board at Carrowntemple is quite good so rather than re-write the information we are presenting an abbreviated version of that board. "The early monastery at Carrowntemple is said to have been founded by two brothers whose names are not recorded. ....At the time of Elizabeth I it belonged to Ballymote Castle Its slabs were not recognised for what they are until 1973. Within concentric enclosures of 0.4 ha. (1 acre) and 6 ha. 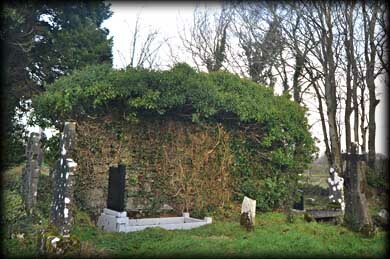 (15 acres) are the remains of a plain medieval parish church, probably on the site of earlier wooden churches. Souterrains to the west would have served for storage and refuge. Fourteen sandstone Early Christian glave slabs were found mainly to the south and east of the church within the old graveyard. Half of a cylindrical plinth stone, presumably to hold erect the double-sided No 10 (slab) was found. 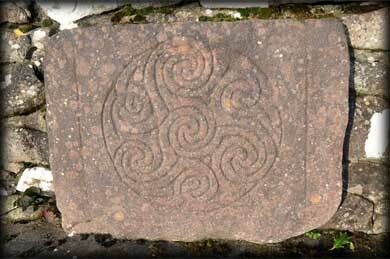 The designs are much more elaborate than those of any other Co Sligo grave slab of the period with the exception of those on Inishmurray. Nos. 2 & 3 have art that is derived from pagan Celtic Iron Age art. No. 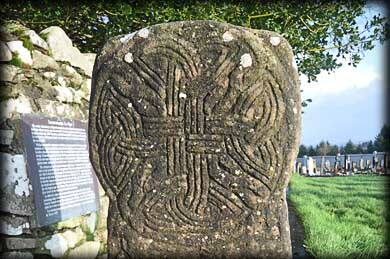 3 is very similar to a design in the Book of Durrow datable to c 650 AD. A 7th or 8th century date is thereby suggested for many of the slabs. On Nos. 3,4,5,6,8 and 11 it is the band and not the groove that forms the design. The slab rough-cut No 14 has the beginnings of a design. 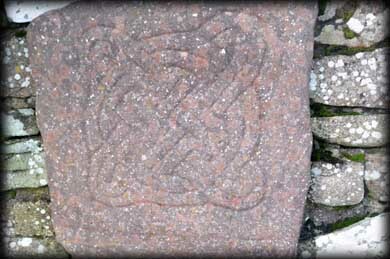 This may indicate that the decorative work was done prior to the dressing of the slabs on the site. 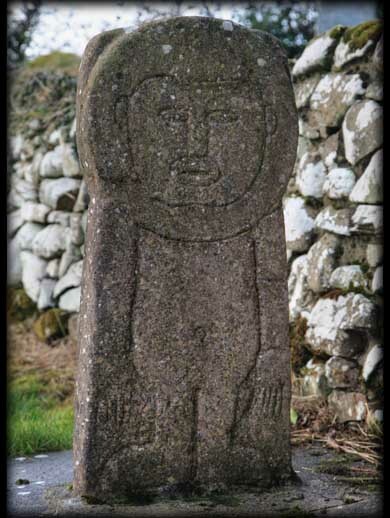 In 1984 five slabs were removed but were recovered in 1986; later the remaining slabs were taken into care by Sligo County Council. In 1992 Sligo County Council erected the replicas made by Cillian Rogers. Two of the original slabs have been on display in the Treasury of the National Museum of Ireland." Slab 10 is described as bearing a human figure, but it is one of the strangest figures I have ever seen on a slab or Cross. It could be described as an early Darth Vader. Situated: From Ballaghderren on the N5 take the R 293 towards Monasteraden. After 4 k turn left for Gorteen. 4k turn left signposted Carrowntemple. 2k down here on your right.